From the 8th to the 10th of February, Prague Youth Theatre will be partaking in their 6th CLASS in ACTION- a three-day action-packed international youth theatre festival held in Prague each February. CLASS in ACTION- which is organised by The Bear Educational Theatre and the Independent Original– offers youth theatre groups the opportunity for young people to meet and work with like-minded friends from around the world to create theatre and perform in an inclusive, friendly and supportive environment. CLASS in ACTION is open to speakers and students of English aged 12-18 from all schools and youth theatre and drama groups with any level of acting experience. The annual festival aims to promote creativity and provide young people with a space for understanding international perspectives through theatre making and English language learning. Previous groups have travelled from near and far including the Czech Republic, UK, Ireland, France and Russia. Prior to meeting in a professional theatre in Prague in February, theatre groups are given a choice of three themes for the year to devise a short script. The groups then rehearse their play, make costumes, design a sound and lighting plan before meeting with the other participating groups. On the Thursday of CLASS in ACTION, participants become familiar with the space and equipment by rehearsing at the theatre venue and meeting their fellow participants. 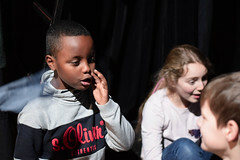 On Friday, the theatre groups perform their devised script to the other groups and on the Saturday, the groups are split up and mixed to give the young actors the chance to work and create with new faces on a short play which is performed later on in the day. On the Saturday evening, there is also a gala dinner with an awards ceremony and a disco to celebrate the young actors’ accomplishments and new friendships that have been made. We recently spoke with Prague Youth Theatre’s new Assistant Artistic Director Liam Hallahan to find out more. Liam is excited to be taking part in his first CLASS in ACTION. Hello Liam! What is the theme that the PYT students have chosen for this year’s script? This year for CLASS in ACTION, there are three themes to choose from for our devised piece: ‘Surprise’, ‘The Pen is Mightier than the Sword’, and ‘Race Against Time’. The one we chose is… classified. You’ll have to find out at the festival! What is the script about and how did you and the students come up with the idea? No spoilers! But for the initial devising process, the actors all split into different groups. They had to make a 5-10 minute piece that used one of the 3 themes, as well as some other extra ingredients. These were things like ’20 seconds of silence’, ‘A reference to a famous movie’, or ‘A sudden change of location.’ Oh, and they only had 20 minutes to make these pieces. They all created some fantastic little pieces in that short time frame, and from that they were able to figure out how to expand and combine those pieces into a larger, more fleshed out one. How are you preparing for CLASS in ACTION? Now we’re just rehearsing away, polishing our piece before showtime! We started at the beginning of January and have been pretty much working nonstop since then! What are you most looking forward to about CLASS in ACTION this year? This is my first CLASS in ACTION with PYT, and I’m mostly excited to see how it all runs! Youth Theatre festivals are always loads of fun and super inspiring to watch too. So much raw potential! Any advice for groups thinking of partaking next year? Just jump in and wing it. It’s theatre, not brain surgery. Have fun with it, and don’t stress!